Fourth in the Olympic Game road race; fourth in the Olympic time trial; third on stage one of the Eneco Tour and now second in today’s time trial. 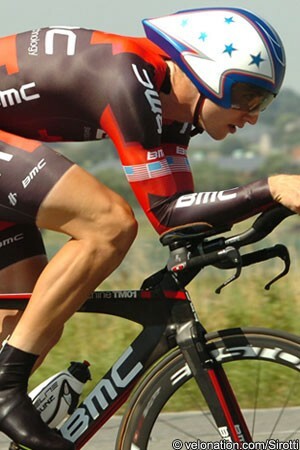 Taylor Phinney’s run of near misses continued today, but the young BMC Racing Team rider showed considerable level-headedness in his response. Phinney set off early on and clocked up a time of 20 minutes 30 seconds for the 17.4 kilometre distance. That held up when other big names came in, including Alberto Contador (Saxo Bank Tinkoff Bank), but finally Orica GreenEdge’s Svein Tuft did just enough, going five seconds faster. The 22 year old American has been in superb form of late and while the validation of a win didn't happen today, his directeur sportif Max Sciandri said he got an alternative indication that he put out a top performance. “He did a fantastic ride, very strong, with a good cadence. Everything was there. He put out his best average power ever so he couldn’t have been any better,” he said. Phinney and team-mates Greg Van Avermaet plus former world champion Alessandro Ballan have one more chance to chase a victory tomorrow when they compete in a lumpy final stage. “We will play all our cards tomorrow,” promised Sciandri. Had the squad not been hit by bad luck in the stage two team time trial where two riders crashed and the others had to ease right back, Phinney would have had an even bigger incentive to ride aggressively tomorrow.